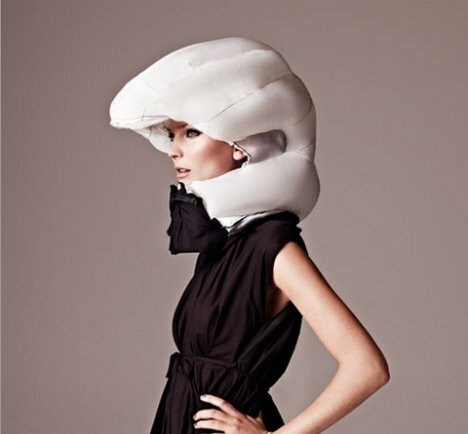 It’s an airbag for your skull, designed for biking. Wonder how long before this is accepted for UCI/USAC events? (Never.) Here’s a video of the helmet in action! The Hovding apparently resides in a stylish scarf-like thing that lies around the neck. They’ll supposedly be released in the spring. Not sure if they will be available in the US as I cannot read Swedish. Found this over from some bike-commuting co-workers who sent me the link from Popular Science. 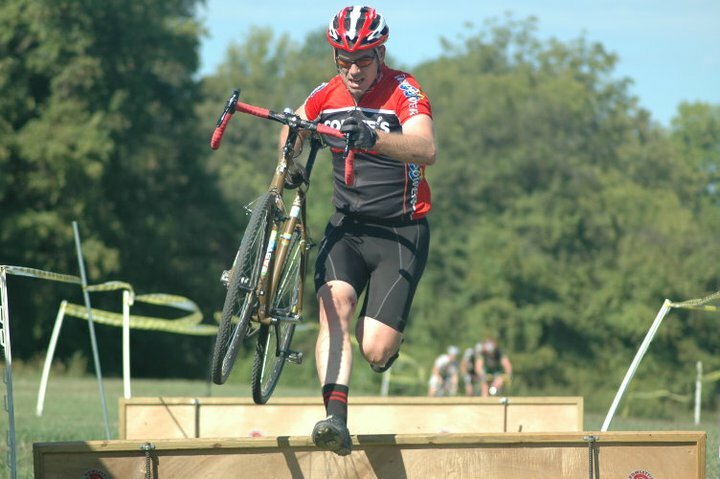 Raced three times at Bryan Park on Saturday the 9th, first in the masters 35+, then a one-lap time trial and later in the B’s. In the 35+ field, I was quickly dropped on the fast course, which featured a lot of road, due to a poor start and my own lack of form. I ended in 11th on my old geared Giant. An hour later I raced the time trial for the weekend omnium and finished 6th in 4 minutes, 53 seconds. Maybe I should be racing better or maybe my issue is endurance. 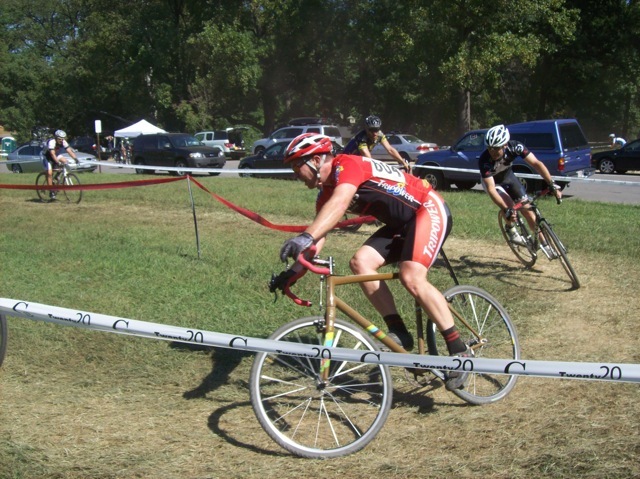 Later I raced the singlespeed Raleigh in the 3-race, which also featured the collegiate Bs. 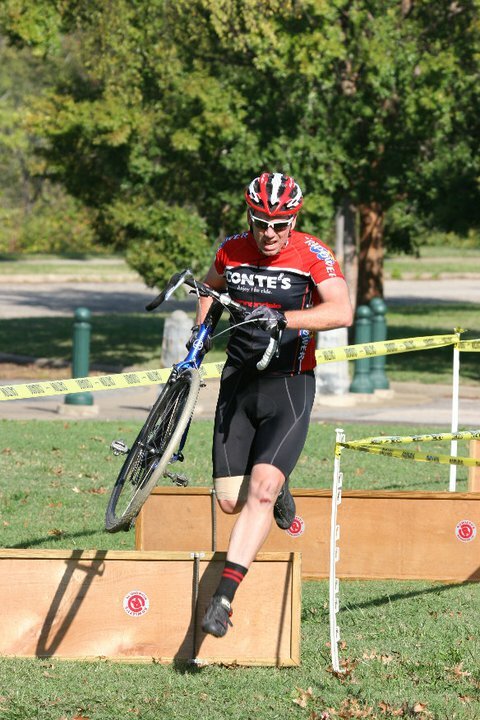 I felt better in this race and actually was dueling with a few guys rather than riding alone. I was shocked to find myself spinning away from guys on the road with the singlespeed 42×18 gearing. The other guys must have had some tired legs. Loved how the SSCX handled too. Much more sure footed than the Giant. Unfortunately I also experienced a dismount fail, missing my saddle on the jump and landing with my inside thigh on the rotating tire – big cut and bruise. My Tripower teammate Mike Park captured these images. 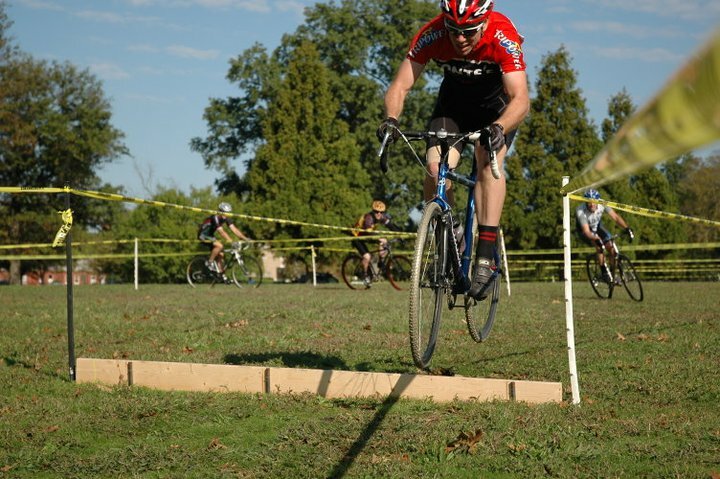 The next day we raced at Chimborazo Park on the other side of Richmond. My result was much the same on a very different course. The starting third was atop a flat plateau, which was followed by a screaming, weaving descent to the bottom of the park and a long grind of a climb, including stairs, back to the finish. I got 12th in 35+, which ,thanks to the time trial the day before, settled me in 7th for the weekend. 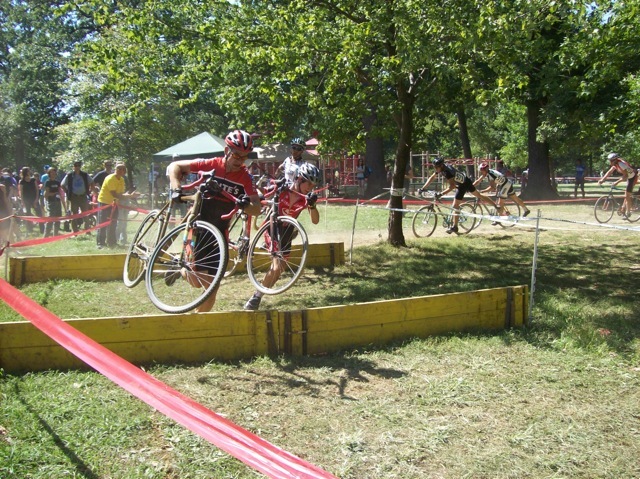 These are some cool shots over the super tall barriers and on the off-camber downhill turn from teammate Tami Cole. 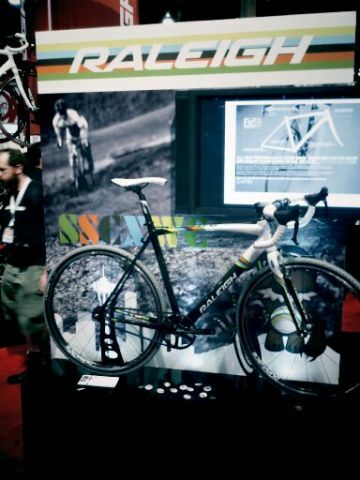 Raleigh is showing a new SSCXWC frame at Interbike 2010. It’s carbon goodness with a belt drive. Mmm. That’s not a great picture of it. 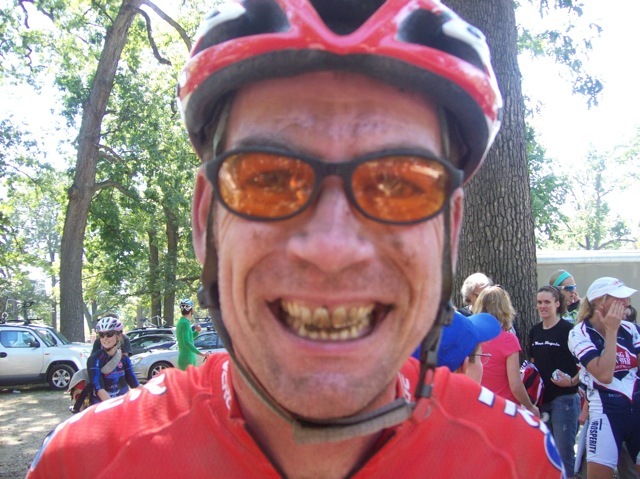 There’s more of this eye candy on CX magazine’s site. Wish I could figure how to afford and fly to Seattle for this year’s Single Speed Cyclocross World Championships in late October. 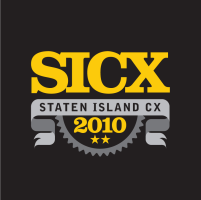 Perhaps the Singlespeed Intergalatic Championship at Staten Island CX in mid-November will have to do. No, I haven’t been blogging. 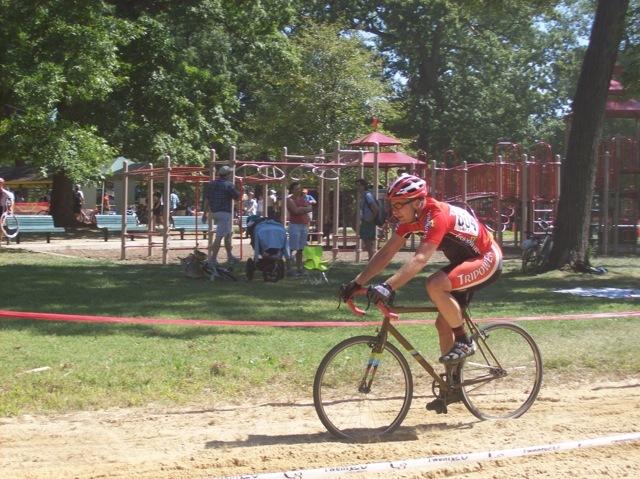 Facebook and Twitter have proved distracting, but I raced the season’s first cyclocross race Sunday in Baltimore: Charm City CX. Since the masters race was sold out, I signed up for the 2/3/4 “B” race at noon. As the 104th person to register, I was called up 104th and could see the front row of the race about half a block in front of me. That was the last time I saw the front. I raced singlespeed by choice. I wanted to test my new rig – a Raleigh SSCXWC – to see how it would do and just have fun. The start was the typical large cluster with 125 guys trying to make it to the first corner. At each of the first few turns, traffic jammed up and we were brought to a standstill as the front of the race rode away. At one early off-camber chicane, I was able to dismount and squeeze a pass by about 15 or so guys. I settled in and started trying to pick off a guy here and there. The 42×18 gearing proved fine for the course. It was fast, dry and very dusty. There was one power hill that made me wish for a lower gear and a few flats that required me to spin my arse off. I powered through the sand pit when I could without running into traffic and railed some corners on a few sweet, swoopy downhills. I did more passing than being passed until the very end of the race when a group of five guys I’d just spent the last lap working my way through sprinted past me on the flat paved finishing stretch. I did want a few gears there. My finishing place was 68th, so I made it up through about a third of the field. I felt good enough that I wished I’d had a better starting position, though I might have still run the singlespeed. It’s nice not having to think about what gear to shift into. Special thanks to Ellie, my oldest, for the fine photos. Just hibernating as I learn to play on Facebook and Twitter. I do want to point out to the old woman driving the silver Lexus with the fur coat and bug-eye glasses and turning from Colley Ave. onto 20th Street that, yes, bicycles do have the right-of-way. Your horn is still ringing in my ears. I can hang with those guys, really, I can. At least some of them. 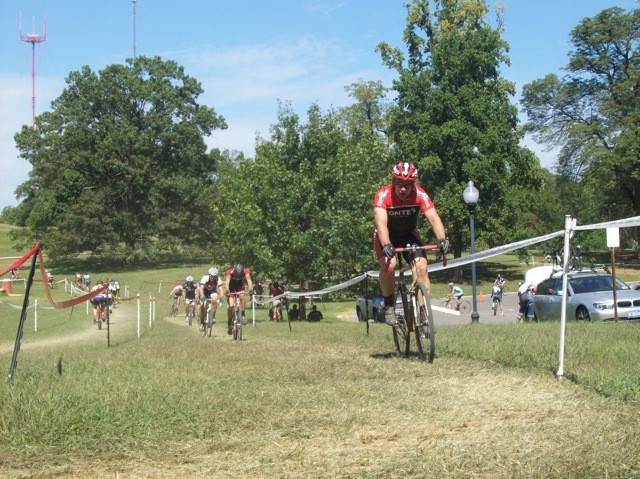 As long as the course doesn’t entail a climb longer than 100 feet or so. 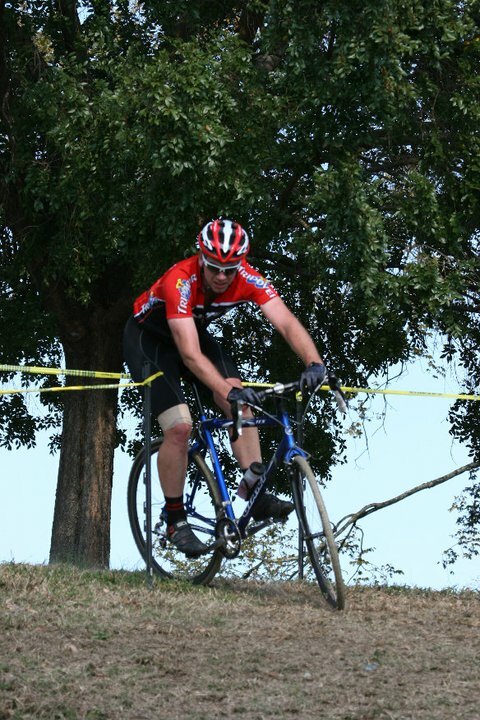 A couple of weeks ago at the second Camp Hilbert race, I passed my Tripower teammate Kevin midway through the first lap and might have held on if I hadn’t flatted my old tubeless front tire and DNF’d. This week, racing the Walnut Creek Chimney Chase near Charlottesville, Kevin got a great start and put me away early in the climb intensive first half of the 11-mile lap. Two laps served up 2,300 feet of climbing and descending on a technical, root and rock strewn course. Kevin weighs 150, if that, whereas I hover around 190. I may have more power, but he makes it up those climbs faster because he’s so scrawny. Advantage, K-dawg. 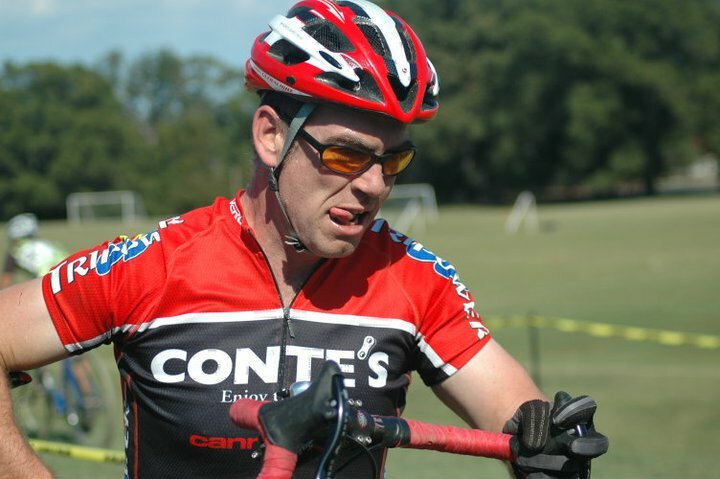 Meanwhile, our other teammate Bill “Goat” Gilmer, who’s been sandbagging masters races this year, sailed away from both Kevin and I early on as he chased the leading elements of the 20-plus expert vet field. He finished 7th in the stacked field, while Kevin got 11th and I managed 15th. No idea what the times were, but I’m told I was about five minutes behind Kevin. Jerry “12-pack” Hadley rolled in a while after me in 17th despite his intensive hydration program the day before. Sadly Chad Holm, who rode up with us the day before, flatted out early, but Liz Schleeper got fifth in the expert women’s field that was dominated by DeeDee Winfield. My race started well enough. I was mid-pack early, but the wheel I followed on the early climbs thrice couldn’t make it up the steeps, forcing dismounts by both of us as other riders rolled by. I couldn’t get away from him for about a mile, but finally did. I soon caught Jerry, whom I distanced on two climbs, but charged up on my wheel on the next downhills. Lost him about three miles in on a longer climb. I felt better and better on the first lap and passed a handful of riders. However, about a mile into the second lap, my arms and shoulders grew tired and I slowed to avoid an accident from sloppy handling. The climbs I’d spun up on the first lap, chewed me up on the second. Two riders I’d passed came back by me. I’d hoped to catch one of them on the second half of the course, which was more suitable to me, but he finished maybe 15 seconds in front of me. After racing in the muggy Charlottesville summer heat, a dip in the lake at the park was a great way to cool off. Charlottesville Racing Club put on a nice race. Next time I need to remember to pre-reg and avoid that onerous $10 same-day fee.